6,000 businesses across rural Devon and Somerset are set to benefit from a new business support service, launched today by the Heart of the South West (HotSW) Local Enterprise Partnership (LEP). Entitled the Heart of the South West Business Support Service, the package provides a range of options to help businesses grow and develop. This includes face to face business advice from a team of specialist business advisers; an interactive workshop programme; an innovation programme; specialist support for women’s led enterprises; and a voucher based support programme. The aim is to create a strong programme of support throughout the HotSW area, which will stimulate business innovation, helping to boost the local economy and increase jobs. Just under £1m is being invested into the business support programme across Devon and Somerset. The service is part of the wider Rural Growth Network for Devon and Somerset, which is being led by the HotSW LEP in partnership with Devon and Somerset County Councils. Funding comes from the Defra sponsored RGN programme as well as Devon County Council , which is providing support for innovation in rural businesses. The Heart of the South West Business Support service is delivered by Peninsula Enterprise, who has been working with businesses in the South West for over 20 years and has extensive experience of engaging businesses and delivering economic impact through business support. David Hynd, Head of Rural at Peninsula Enterprise said: “This new service provides the essential advice, knowledge and guidance that rural businesses need to succeed. 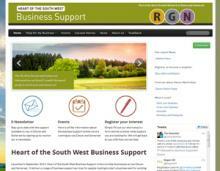 To register your interest to receive support through the service, please visit www.business-supportsw.com. The website has information about the programme, as well as providing a local, easy to use gateway to other sources of business support.